The Alberton Shire Soldiers’ Memorial – also referred to as the Yarram War Memorial – was unveiled by Major-General C F Cox, assisted by G H Wise MP, on Wednesday 10 August 1921. At the ceremony, reference was made to 700 men who had enlisted from the district and the 80 who had not returned. However, nearly another 9 years passed before the names of the dead were added to the memorial (April 1930). This was 15 years from the time the first men had been killed at Gallipoli. This entry was posted in Memorials, Resources on December 6, 2016 by pcashen. The Roll of Honor of Alberton Shire lists the names of 446 men who served in the AIF and identifies (*) 62 of these who were ‘killed’. The names are printed on parchment which is framed under glass. The measurements are approx. 78 cm x 67.5 cm. The Honor Roll is held by the Yarram & District Historical Society. The Honor Roll was prepared in early 1920. 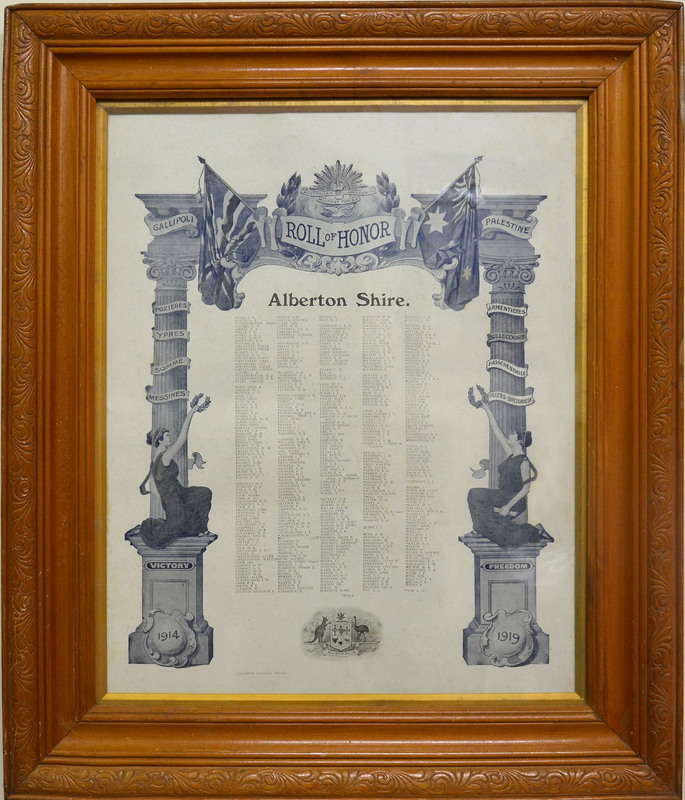 It is based on a hand-written list prepared by the Shire Secretary under the title: Shire of Alberton. Roll of Honor. Men who enlisted and went overseas, or who were in camp at the signing of the armistice preparing for active service. 1914-1918. This list is also held by the Yarram & District Historical Society. The table below features the full names of the 446 men. In a few cases it has not yet been possible to identify a person listed on the Honor Roll. Work is continuing in this regard and when the identities are uncovered the table will be updated. There are some striking shortcomings with the Honor Roll. To some extent the problems came in the process of transcription from the hand-written list. For example, family names and first names have been transcribed incorrectly: GEARING on the list became GEDRING in transcription and GOULDEN became GOULDER. Also, the apparently idiosyncratic order of the names came from the hand-written list. Apparently what was meant as a working document became the de facto formal list. At the same time there are shortcomings that go beyond transcription. Probably the most serious is the identification of those ‘killed’ on active service. The table below shows the extent of the problem. First, 2 men (Loriman and Pulbrook) were identified as having been killed when in fact they were not. There is a slight possibility that in one case this could have been another transcription error, but whatever the cause, the seriousness of the error is obviously of a high order and it is hard to understand how it occurred or why it was not picked up. Second, the Honor Roll did not identify another 27 men who died or were killed on active service. It seems remarkable that a public memorial such as this could be so wrong on this point, particularly given that 9 of the 27 names not acknowledged as ‘killed’ on the Honor Roll were in fact featured on the Shire War Memorial in the main street of Yarram, under the inscription: These men Gave Their Lives For Their Country. The accuracy and completeness of memorials is a complex issue. There were problems with transcription and there were also significant slippages of time, for example while the Honor Roll was created in early 1920, the names of the dead were not added to the War Memorial for nearly another 10 years. But beyond such technical considerations, there are deeper issues to do with perceptions of how the efforts and sacrifices of those who served in WW1 were to be honoured and, more importantly, who precisely was to be ‘named’. 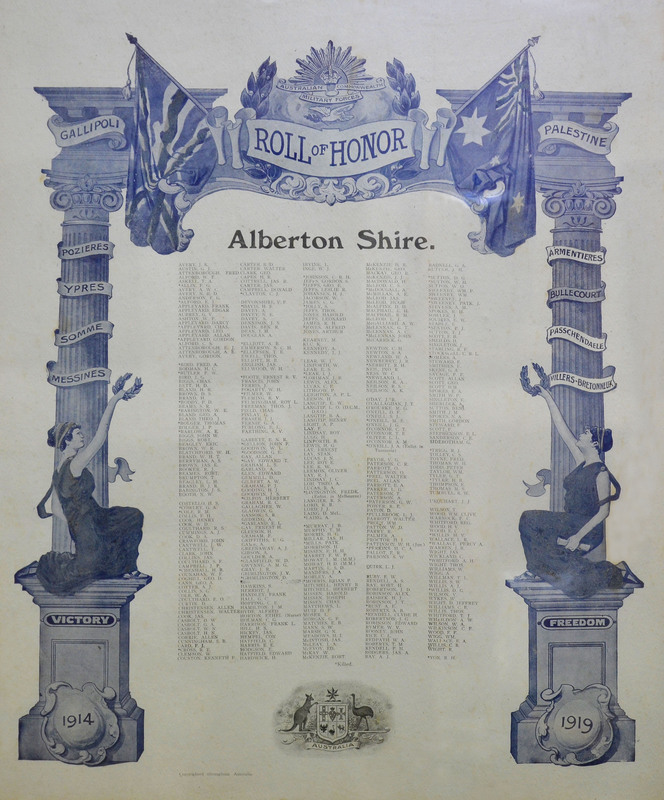 The ongoing research indicates that the 446 names on the Shire of Alberton Honor Roll is not an accurate count of the real number of men from the Shire who enlisted in the AIF and that the real number is more than 600. The research also suggests that most of those missing from the memorials came essentially from the rural working class. This entry was posted in Honor Rolls/ Memorials, Resources on March 12, 2015 by pcashen.